The Translation widget in OS X El Capitan could be a lifesaver. You’ve been able to do this trick on the web for a while, but you can also do it right on your Dashboard. This widget translates words from one language to another. It offers more than a dozen language choices — including French, German, Spanish, Russian, Dutch, Chinese, and more — and can translate in either direction. The Translation widget is incredibly useful when you travel abroad. It’s fun at parties, too. Try this: Type a paragraph or two of your purplest prose into Translation. Now translate back and forth to any language a few times. Howl when prose written as “It was a dark and stormy night when our heroine met her untimely demise” turns into something like “It was one night dark and stormy where our heroin met an ugly transfer.” It doesn’t get much better than this, folks. 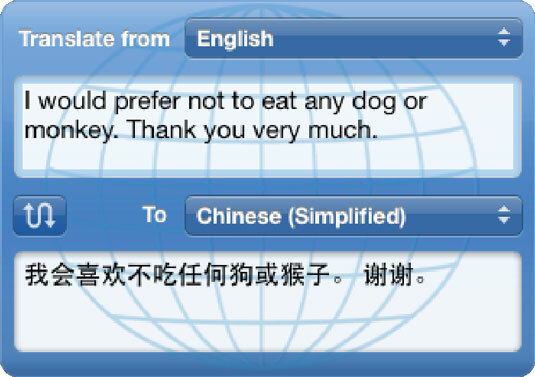 Alternatively, you could use iTranslate or Google Translate, both free translation apps, on your iPhone or iPad.